Mississippi Delta girl-turned-“Today” show correspondent serves up menus for every occasion and tips for entertaining success. 32 S. Section St., Fairhope. They say public speaking is near the top of the most feared activities, but they didn’t ask me. For me, the thought of hosting a dinner party, with all the menu planning and house cleaning and guest-list making, is enough to make my oven-mitted hands sweat. But I do it anyway because I love food — and I love people. 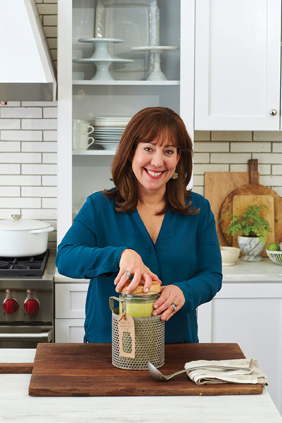 So I was very excited — and a wee bit intimidated — when I set out to interview Elizabeth Heiskell, entertaining expert and NBC-TV’s “Today” food contributor, about her new cookbook, “The Southern Living Party Cookbook: A Modern Guide to Gathering.” A guide to gathering is exactly what I need, and I couldn’t wait to ask Elizabeth how to use it. The morning we spoke, she was elbow-deep in ground hamburger, prepping for a weekend sorority event. Her Southern accent, as thick as the cutting block I imagined her standing at, quickly put me at ease. But what I was really hoping her sugary words would assure me is that her updated version of Southern Living’s top-selling cookbook would cure my “perfect menu” phobia. It certainly does. Included alongside complete menus for every occasion imaginable — from “Impress the Boss Dinner” to “Garden Club Luncheon” — are lifestyle tips and tales of Elizabeth’s own tussle with hosting nerves and misguided priorities. Her hilarious story about being caught on her hands and knees, head in the fireplace, rearranging lava rocks as guests arrived might sound familiar to more than a few frazzled hostesses. “I’ve been catering for 20 years,” she says, “and I still get nervous before a party, like head flipping around, nearly losing it every time.” Elizabeth’s admission certainly gives some perspective. But for those in need of more concrete party-hosting tips, like how not to throw your own head around or get lost in pillow fluffing — or lava rock rearranging — the book has specific words of wisdom. Perhaps the most important lesson to learn is remembering the true reason for the gathering: sharing a meal — and a few laughs — and making sure guests leave knowing their importance. And that is certainly reason enough to gather. RULE 1: Your guests are your friends, not your enemies. They’re just grateful to be included. or quality of your bathroom guest towels. 1. Preheat the oven to 325 degrees. Fit 1 pie crust into each of 2 (9-inch) deep-dish pie plates according to the package directions; fold the edges under, and crimp. Sprinkle the pecans and chocolate evenly onto the bottom of the pie crusts. 2. Stir together the corn syrup, granulated sugar, brown sugar and bourbon in a large saucepan, and bring to a boil over medium. Cook, stirring constantly, 3 minutes. Remove from the heat. 4. Bake in the preheated oven for 55 minutes or until set; cool the pies completely on a wire rack, about 1 hour. 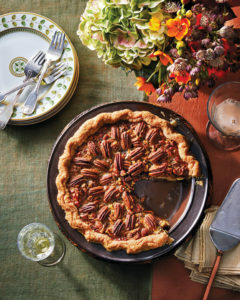 Excerpted from The Southern Living Party Cookbook by Elizabeth Heiskell. Copyright © 2018 Oxmoor House. Reprinted with permission from Time Inc. Books, a division of Meredith Corporation. New York, NY. All rights reserved.